Some time in early 1994, when I lived in the mountains of North Carolina near Asheville, I finally received verbal permission to detect an old churchyard I'd had my eye on for some time. The church was perched atop a large hill. Though a 20th century building occupied the site, there were many old tombstones in the cemetery and according to the sign out front, the original church had been established only a short time after the first white settler, Samuel Davidson, had built a cabin in that area in 1784, and was subsequently killed by the Cherokee, who viewed him as a trespasser. The long-vanished original church was probably a log structure, as were most antebellum buildings in the region. I was understandably excited, and impatient to detect the site, so much so that one of my first outings took place in a fierce snowstorm. I would dig a target, then dash back to the car heater to thaw my frozen fingers. That first day, in the blizzardlike conditions, I found several early Wheat cents in the same hole; after four of them came up, the fifth coin proved to be an 1899 Indian cent. Finally, I was finding the 19th century coins I knew would be there! One promising signal was too difficult to dig because the ground had frozen, so I left it until the spring thaw. It later proved to be a 1900 Barber dime. That summer, I found an 1894-O Barber half dollar on one corner of the church, near the building. I was astonished at how relatively shallow it was: I cut a plug of sod about two and a half inches deep, and it popped right out! It's well-worn and was probably lost sometime in the 20th century, but it was an exciting find for me, particularly as I had not dug any silver half dollars at the time (and to date, I have yet to find a second Barber half). On another outing that August, around the time I dug the Barber half, I found a curious bronze or brass disc, which had a plain back and a small cartouche on the front with Chinese characters. It was about four inches deep. I was mystified as to its identity. Obviously it was fairly old and had almost certainly been in the ground at least 50-100 years (after all, it was deeper than the 1894-O half dollar that was found a few feet away, though that doesn't prove anything). Because of the way it was made, with a perfectly rounded edge, I assumed it was no older than perhaps the late 1800s, or no newer than the 1920s. Usually I am pretty good at guessing the age of things. Eventually, I tossed the mysterious object into my "Interesting Junque" drawer, where I put all the finds that are not really valuable but are too interesting to discard. I mostly forgot about it for a decade. A month after finding the Barber half and the mysterious Chinese artifact, I left North Carolina and moved to southeast coastal Georgia. More than a decade later, in early 2006, I decided to dig the strange artifact out of the drawer, scan pictures of it, and see if someone on the Internet could translate the Chinese characters. I found that the Chinese inscription, translated, reads, “Authorized and awarded by XuanDe of Great Ming”. Xuan De (1426-1435) is the era of Xuan Zong, who was the fifth emperor of the Ming Dynasty. Ming Dynasty? Early 1400s? Whaaat? Surely this couldn't be a 600-year-old Chinese artifact that I'd unearthed from a churchyard in a small Western North Carolina town! After all, the edge was perfectly round. It looked almost machine-made. No doubt it WAS old- as previously mentioned, I had little doubt that it was at least 50-100 years old, but over 600 years? No way. Or could it be? In the fifteenth century, the Chinese were far more advanced than the Western nations, who had not quite emerged from the Dark Ages and into the Renaissance. As a world numismatist who's handled a few ancient and medieval Chinese coins, I have observed that many of those are perfectly round, unlike the hand-hammered European coins of the same era. After posting the artifact on the Treasurenet Forums on the Internet, I was contacted by a Dr. S.L. Lee of Columbus, Ohio, who wanted to research the item. I told him all I knew about how and where I had found it, and told him I would send it to him for examination. If he was interested in purchasing it, he could send me a check for whatever amount he thought fair. After all, I had no idea what it was, and to me it was just a curious round item from my junk drawer. He sent me a modest check which was slightly higher than the very low value I had in my head, and I was satisfied. Then he pressed me for more detailed information. I reiterated what I had told him before, in as much detail as I could muster from memory. I have a semi-photographic memory and if I were to visit the site today, I could point to within five or ten feet of where I found the item. Later, Dr. Lee emailed me a photograph, asking if it showed the correct site. It was a photograph of him, standing behind the church, just downhill from the exact spot! Now, let's pause to consider this, a moment... Dr. Lee is from Columbus, Ohio. This means he climbed on a plane and flew to North Carolina, just to visit that tiny town on the outskirts of Asheville, and had somebody take that photograph of him standing just below the very spot where I'd dug that artifact a decade earlier! What in the world had I found, that was so important to him!?! Yikes! When asked, he merely replied, "You will know." A few months passed, and the pressures of daily life drew me away from the mystery. I let my email correspondence with Dr. Lee lapse. Then I decided to post the mystery on the Collectors Universe Metal Detecting Forum, which is one of my Internet haunts. The people there were intrigued, wondering, just as I was, about what was so important about this artifact that Dr. Lee would travel so far in his research. After some webcrawling, I discovered that the trip from Ohio to North Carolina was not the longest journey Dr. Lee had been making. He had given some lectures in Hong Kong in June of 2006. When I saw the poster from the lectures, I was flabbergasted. There, front and center, was my mysterious medallion! Apparently, Dr. Lee believes it might be evidence of contact between the Ming Dynasty Chinese (possibly the famous explorer Zheng He) with Native American tribes! Zheng He and his large fleet sailed in 1430, more than half a century before Columbus' voyages to the New World! "A 7-cm diameter plain brass medal with the inscription “Authorized and awarded by XuanDe of Great Ming” was unearthed several hundred miles inland from the American east coast. In 1430, Ming Emperor Xuan Zong commissioned Zheng He to deliver a message to foreign nations that he was enthroned with a new era named Xuan De. This was the whole purpose of the 7th and the last expedition for Zheng He. “Did Zheng He’s excursion reach east America? Or is there other explanation?” The owner of the disk, Dr. Siu-Leung Lee, would like to present some interesting observations and leave the conclusion to the audience. Ming emperors had a diplomatic protocol to announce enthronement and new era by sending gifts and medals to other nations. Xuan De (1426-1435) is the Nianhao (era) of Emperor Xuan Zong, the 5th emperor of Ming dynasty. In 1430, he dispatched Zheng He to announce his enthronement. The medal represented the highest authority of the emperor and was only delivered by a diplomat like Zheng He or his deputy. After Xuan Zong died, China isolated herself from the rest of the world for more than 400 years. Chinese started to come to America after 1850s as indenture labor mostly through the west coast to mine gold and build the railway. Few Chinese came through this part of the east coast where the railway was built exclusively by slaves and convicts. Today, this little town of 9000 has 4 Chinese by US Census in Year 2000. This brass disk is minimally decorated with little monetary or artistic value to Chinese laborers and European missionaries, who are the other possible but unlikely carriers of items from China. There should be quite a few medals of this kind in those days, but the unused ones were usually collected, melted down and recycled by the next emperor. Those countries along Zheng He’s route all suffered from multiple wars. Items like this were easily lost in looting. The brass medal was discovered under 4 inches of soil in a scantly populated area several hundred miles inland from the east coast of America. After almost 600 years, the medal shows no apparent signs of corrosion, other than a tight coating of soil. Elemental analysis of the medal shows that the material is brass, a copper alloy with zinc. Xuan De was exactly the era when brass first became available, as exemplified by the famous Xuan De brass censers and coins. The brass medal was unearthed at the center of Cherokee Indians’ homeland that became a major battleground with the first European settlers. Hundreds of Cherokee Indians were massacred in multiple battles. In 1776, right after the American Independence, the Cherokee’s land was grant to the soldiers in lieu of pension, resulting in another major battle. Could the Cherokees be the ones who lost the medal in the war? The Cherokee people were later driven more than a thousand miles away to Oklahoma in 1838-39 in a historical event known as the “Trail of Tears”, during which thousands of Cherokee Indians died. During the colonial era, 90-95% of the Cherokee perished. But why was the medal found inland? Did they obtain it from other tribes near the coast? Sounds like a stretch, doesn't it? Well, sure it does. Dr. Lee admits that nothing is conclusive, but the artifact, if genuine, certainly raises some interesting questions, some of which may never be answered. (And even if it isn't genuine, I have to personally wonder how it ended up in that churchyard). One problem Dr. Lee mentioned is that the item is apparently quite unique. He is hoping that a similar specimen will appear somewhere else in the world, for purposes of comparison. At least one critic, Geoff Wade, has scoffed at Dr. Lee's research, calling the medal a "shoddy fake" after examining his photographs of it. It's not surprising that some controversy has arisen, and that sides are being drawn in the debate over such a potentially large historical riddle. However, Dr. Lee doesn't really appear to be claiming much of anything; rather, he seems to be merely noting interesting cross-cultural historical parallels, some of which may be mere coincidence and some of which might have fascinating implications. I personally can attest to one thing- the medal was truly dug out of the ground, by me personally, as I have described. Beyond that, the rest remains an enigma. Certainly the site is a strong candidate for Native American occupation long before the church was built: its high hill commands the surrounding land, and twice while digging in other churchyards in the area, I accidentally unearthed stone projectile points, one of them from the Paleolithic era. What is good real estate today has usually been considered good real estate for centuries, if not millennia. Down here in coastal Georgia on the sites I have hunted, I commonly find pre-Columbian pottery sherds mixed in with later European artifacts from the colonial era, where old plantations were built atop earlier native sites. I often hunt these sites when they are being cleared for modern construction, which will add yet another layer to the archaeological strata. Below: stone projectile points of a whitish quartzlike material, found at unrelated but nearby sites. Both were fairly shallow and coincidentally happened to be found at old churchyards in the same general locality. Left: prehistoric paleolithic-era point found in 1994 (not long after the Ming medallion), while digging a piece of rusty, fairly modern trash. Right: crude (unfinished?) point found in 1993, while digging an 1884 Seated Liberty dime. "After 600 years, many leads for the cold case of Zheng He have vanished. I can only provide some observations and raise questions. These observations may or may not be proofs of anything. The purpose of my presenting these observations is mainly to draw more information either for or against the observations as evidence for Zheng He's fleet reaching America before Columbus did. In reality, it won't change much of the present and future of America. If Zheng He did reach America before Columbus, all we have done is an amendment of the 'official' history that has been destroyed by the Ming critics of Zheng He. As one of the world's greatest navigators, Zheng He deserves vindication if he or his fleet did reach America before Columbus. * The medal is found in a major battlefield bwteen the native Cherokee and the first European immigrants. * The Cherokee is recognized as the most intelligent tribe among the natives. * The Cherokee people had a flag with the Big Dipper as a symbol, the same used for imperial China throughtout Song, Jin, Yuan, Ming Qing. *The Big Dipper has been regarded as the most important constellation by the Chinese as far back as the first dragon motif in Henan, probably 6500 years ago. The Cherokee do not have records of other constellations. * No other flags in the world has Big Dipper before 1900s. It is absent from all historical American flags. * Zheng He used the Big Dipper as a guide to navigate in the northern hemisphere. * Honoring the Big Dipper peaked in Ming dynasty when emperors strongly favored Daoism. (There are many observations associated with this). * The territory between Cherokee and the east coast was inhabited by Catawba, a tribe with potters in every family. Today, they still make a traditional pot that resembles Xuan De censer. * Catawba and Cherokee are rivaling neighboring tribes with trade relationship. * Catawba language is now extinct, but the word for porcelain clay is retained in Cherokee language : "unaker", a word transliterated into English, similar to the name Uk-na(ke) as it is called by Ming Chinese. The (ke) part is silent in Chinese as Ru-Sheng, but in Cherokee language the ending is always sounded out. The term for porcelain clay was renamed to something else after Qing dynasty. This word "unaker" is listed in some English-Chinese dictionary as "Native American name for porcelain clay". The Cherokees do not have the "r" consonant, and they have another term for common clay. * The porcelain industry in England was built on porcelain clay imported from the native Americans (Cherokee and Catwba) even though porcelain clay was a rich reserve in Cornwall, England. Processing natural clay to porcelain clay is a complex process that Europeans in industrial revolution era could not master, while native Americans did. You may find more information by search for keywords listed above. In the end, the medal only serves as a lead. The other observations remaining in native American culture are much harder to erase. These observations weave into an incomplete picture, awaiting more pieces of the jigsaw puzzle. I am not making any conclusion on whether Zheng He made to America or not. In Ming official history, Zheng He's "death" in Calcutta was only supported by a bundle of his hair and a pair of his shoes. Notably missing are his head-dress, official gown and sword. I don't think any good forensic scientist today would accept the hair and shoes as a proof of death of anybody. Postscript: Dr. Lee has agreed to credit me with the find. I am not currently mentioned in any of the articles about it because he said he wanted my permission beforehand. 2013 postscript: I found another historical anomaly here in Georgia in 2011. Though perhaps not as significant as the Ming Medallion, it is a thousand years older! Last edited by lordmarcovan; Jun 13, 2013 at 02:23 AM. awesome story! get out there!! This is really neat. What an intriguing story. It is certainly motivation for me to find out what some of the what'sits are that I have picked up over the years. I never knew about the Chinese/Cherokee connections either. That was interesting! Great find, and thanks for sharing the story. Holy crow! That's one stunning find there! We all know there's no such thing as a "hunted out" location. Let's stop using that phrase to describe a park out of which you just dug a pile of coins! Obviously that particular place wasn't "hunted out", right? Lost Again and Don't Care Who I Tick Off! That is one of the most fascinating stories that I have read in a long, long time! What a potentially paradigm-shifting discovery,and to know that you played the major role in it lordmorcovan is must feel incredible. I love history and we already know that SAt Brendan and the Vikings were in North America during the Dark Ages. 12th Century Japanese boat anchors and ballast stones have been found off the coast of California, but to have a relic that suggests that the Chinease sailed to the EAST coast of North America is so historically important it is almost beyond value. Cheers for posting this! The only ones for me are the mad ones,&nbsp;the ones who are mad to live, mad to talk, mad to be saved, desirous of everything at the same time, who never yawn or say a commonplace thing, but burn, burn, burn, like fabulous yellow roman candles exploding like spiders across the sky. An utterly amazing find and story. A big THANK YOU for sharing it. Most intriguing, without a doubt. This is the stuff we all seek, in one way or another. Congratulations on a truly remarkable find ! I visit Asheville all the time .My husband's family lives up there .That is one GREAT find ! 1. It is a genuine Ming Dynasty medallion, apparently unique to historians, and it resulted from Native American trade with Chinese explorers, somewhere. A longshot, to be sure, but exciting to speculate on. 2. It is a genuine Ming Dynasty medallion, but it got to North Carolina in more recent times, perhaps from someone who collected antiques. Another longshot, and it still doesn't explain how it ended up in a semi-rural churchyard (that is the million-dollar question, regardless, and we'll never know). 3. It is a more modern fake ("modern" meaning late-19th or early-20th century), but why would somebody fake a Ming Dynasty medallion of previously unknown type? Wouldn't a faker choose to emulate a known type? The first two scenarios are just possible enough to make it an exciting mystery. I am unaware of what Dr. Lee's metallurgical testing revealed, beyond the fact that that type of brasswork was technically possible in that part of the Ming Dynasty. As to the relatively shallow depth it was found at (approximately four inches), there is the possibility that it had been buried deeper and brought up when the ground was disturbed. After all, it was found near a cemetery, though not on top of any marked grave. It was probably too shallow to have been grave goods that accompanied a burial. When detecting in cemeteries, I never carried anything bigger than a hunting knife to dig with, and never dug below six inches, for obvious reasons. Once or twice (on other sites that were near cemeteries) I have come up with coffin handles and such, though, at a fairly shallow depth (never any human remains). I showed the casket hardware to one cemetery manager, and he just told me to rebury them. These days I have enough good detecting sites that I seldom hunt in cemeteries anymore. Regarding really old artifacts that are buried at relatively shallow depths, I did twice dig arrowheads while retrieving metal targets, as I mentioned above, and the multi-thousand-year-old paleolithic projectile point I accidentally unearthed at another church in the same area was only a few inches deep, too, and that was not in a cemetery. I have read that frost can heave buried items up toward the surface, when the ground contracts as it freezes. I suppose that a few centuries of frost heave as well as other factors could leave something fairly shallow. Also, the rocky, clay-laden soil I was digging in up there probably didn't allow fallen items to sink as deeply as they might have down here, in our looser, sandy soil. I will put my 2 cents in.And dont get me wrong. I love hearing about stuff that has no business being there. I am a big Fortean !! There is the posibility it belonged to someone in Colonial North Carolina who lost it many years ago.Ships from America have been bringing back cargo from the Orient for a long time. I like the thought of trade between China and the Northwest coast of early America.That is one possibility. It could have got traded between tribes. I have heard that the Cherokee were great traders.They may have traveled very far. As for the area, there is a lot of history and mystery there. I think everyone who visits the mountains of Western NC can feel it. I am fortunate i live about 2 hours south of them. There have been tales of pre-Columbian coins found in Tennesee and North Carolina. Like Roman and Carthagian. I do believe there is a lot of America's history we don't know. PS: When you find something strange, keep it forever ! Formerly " Mike in SC "
Ancient Roman and Greek coins certainly do turn up in North America from time to time, but I think the stories behind them are easy enough to imagine, and I don't think anyone believes the Greeks and Romans or even the Carthaginians ever made it to our shores (Well, maybe seafarers like the Carthaginians, who knows? That's a BIG longshot, but...) Some of our founding fathers' contemporaries collected ancient coins. Was this medallion something like that- an item lost from somebody's collection, long ago? I have a hard time imagining that. 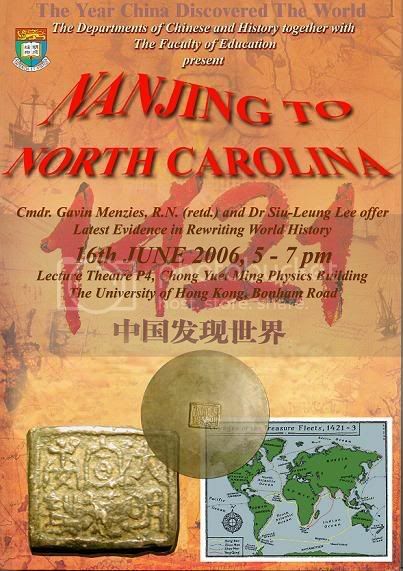 I actually find Dr. Lee's hypothetical Zheng He-Catawba-Cherokee connection a little easier to swallow than the "Collector Loses Unique Ming Dynasty Medal In Churchyard" idea, for some reason. I guess you would have to visit the site to know what I am talking about (and to discourage just that for reasons of discretion, I have edited many of my past mentions of the exact site, in order to be more vague). It's a semi-rural area and a bit of a backwater, even today. In the 19th century, when our hypothetical collector might have lost it, it was even more isolated than that. Not the sort of place where collectors of Ming Dynasty antiques would have lived, much less carried their collection with them to church. This is an interesting topic. I look forward to our discussion. Julius Caesar wrote about in his fight with the Celts around 50 BC( while he was still just a general) that the Celts ships were "larger and faster" than anything the Romans had. We know the Celts were great explorers. Also the Romans had ships plying the Med that were twice as big as Columbus's ships. The Carthagian's (they were basically Phoenicians who settled North Africa)were circumnavigating Africa 2500 years before the Spanish and Portugese of the 1500's. The west coast of Africa to Brazil was a 2-3 week trip in favorable conditions. Island (which is not too far from the coast of Chile) is amazing. Not mention the Arab and Hindu traders who sailed back and forth to China many many moons ago. So i believe the possibility that your medallion could have been traded to some native or given as a gift from some Chinese sailors. About a Colonist losing it , i was only giving an alternative explanation. By lordmarcovan in forum My Best Finds! Diggers Diary: here are a few past coin finds. By lordmarcovan in forum Today's Finds!